The house we live in has the sorriest excuse for a front porch. But it’s still a porch and I’ll take it. Because a need to sit on the front porch is embedded in my genetic material. Porch sitting is simply a way of life in the mountains. It’s for work, for socializing, for relaxing, and for keeping an eye on the neighborhood. Characters in my novels do all kinds of things on porches–cry over men, talk about weddings, wait for family, digest meals. I hadn’t really thought about it until now, but porches show up in all three books. Watched storms roll in. I would sit under Dad’s lawn chair, because that was the safest place. Once, we saw a lightning strike bring power lines down on a barbed wire fence. Spectacular. Processed various harvests. We shucked corn, snapped beans, pared apples, shelled peas–oh, and skinned out squirrels. This was more cool than gross when I was six. Times, they do change! Made ice cream. The hand-cranked ice cream maker sat on the edge of the porch so salt water could run out the little spout onto the ground below. We ate the finished treat right there on the porch. Read stories in the swing. Mom would wash us and gather us up in the porch swing in our pajamas for a bedtime story. There was something about being outside after a bath that made it seem extra special. Talked. We talked and talked and told stories and talked some more. Deer would stroll through the pasture and lightning bugs would come out. Peepers would sing in the spring and owls would hoot after dark. And still we talked. I could go on. Pets lived on the porch. Wild animals lived under the porch (including at least one skunk). The porch light served as a beacon of welcome. Once, we slept on the porch. Now, my husband and I will take a glass of wine out after dinner to sit on our skinny little excuse for a porch and enjoy some lazy talk. No serious topics, no important decisions, just chat. Because porches bring that out–that desire to idly talk about nothing in particular. At peace and in communion. Probably, if we could get the people we don’t see eye-to-eye with to sit with us on a porch with a glass of lemonade, we’d learn that we have a lot more in common than we ever realized. Just don’t disturb the bird nesting in that hanging basket. The eggs should hatch any day now. I love porches, too. We have a little side porch at our new home, and we’ve just acquired the necessary furniture to enjoy it. Our carved toucan and our hummingbird feeder are in place, along with 2 chairs and a small table. And that’s all there’s room for, I’m afraid! It’ll have to be folding chairs for the guests, but we’ll work it out. The porch is one of my fave parts of my house. Even at our last house, when we only had room for a bench on our tiny porch, I remember sitting out there one summer, reading Gone with the Wind. Yes, there’s no place better to relax and chat. Ah yes, reading as a soft breeze caresses your cheek! 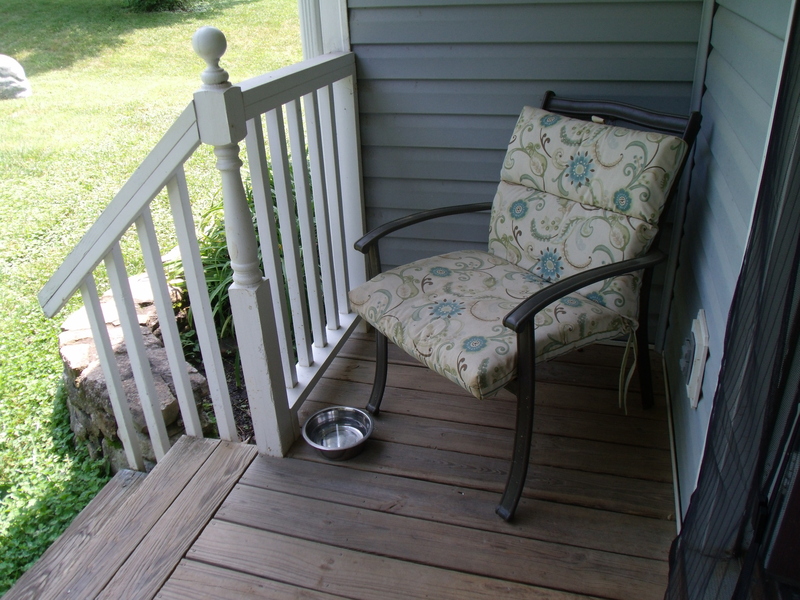 It’s so nice to have TWO porches to choose from depending on what purpose we intend…. watching the neighborhood and foot and vehicle traffic or eating and watching the bird feeders and the occasional getting rid of unwanted critters. AND we have the swing although I’d rather it were on the porch than out in the yard. I’ve always coveted wrap around porches! The wrap-around is part of our dream house. We COULD sit on the back deck and listen to the creek, but there’s the whole bear issue! Love it, Sarah. Note on my page that my nesting birds HAVE hatched. I took a picture today. I am also posting pictures of my porch… the petunias smell heavenly while I’m reading my latest book interest and having a glass of lemonade or sweet iced tea! Miss you. We have a wren–she’s been bringing worms, so I think the eggs have hatched, but it’s a deep nest so we can’t tell. Posted	 August 6, 2013 at 3:27 pm by Carole A. Bell, L.P.C. Growing up, I could walk one block to my grandmother’s house (a treat few children experience today) and climb five steps to her big wrap-around porch. In the summer, the side part had two beds so my teenage uncles could sleep outside where it was cooler. That porch was probably twelve feet deep and the width and length of the house. One of the best parts was the fact that it was on the front of the house, so we could visit with neighbors and passersby. Life happened on that porch, and even then, I loved it. Oh, I envy your childhood porch experience! I always wanted a bed out there . . . Unfortunately, my grandmother never let me sleep outside, but my window was open to my uncle’s outdoor bedroom. Sometimes, I overheard their talk about the trouble they got into. It was actually pretty tame compared to the kind of trouble teens get into today. What fun. I wish I remembered the details so I could tell tales.